Cat status: Two feet apart from each other and fifteen feet away from me. No hissing! Chicken status: Pullets are laying well. Old girls are barely laying and may soon be destined for the pot. Garden status: A deer snuck past our predator eyes just before the new year and ate up the last of our greens. So the only fresh things we're eating out of our garden at the moment is Egyptian onions. Luckily, our freezer is still two thirds full, so our weekly grocery bill is pretty low. I'm already starting to think of spring planting --- just a month until I can put in peas! 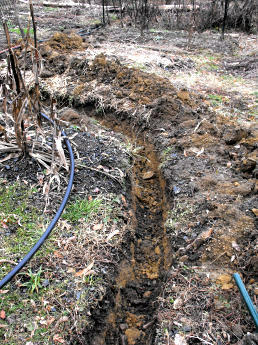 Water trench: I gave up on the trench because it hurt my carpal tunnel too much, but Mark's been digging away at it. As you can see, he's making major progress! Freelance work: Tricking in nicely. Book I'm supposed to be writing: I'm actually writing it! Whipped off the rest of chapter two last week.